Bettina Böhler (*1960 in Freiburg) began her career in the early 80s as a dubbing editor. Subsequently, she worked as an assistant at the SFB and on productions by e.g. Helma Sanders-Brahms, Rudolf Thome and Ulrike Ottinger. In 1985, she edited Dani Levy's feature film Du mich auch. The following years saw Bettina Böhler establish herself as one of the most distinguished editors in German cinema, and she worked with Christoph Schlingensief, Angela Schanelec and Michael Klier, among others. 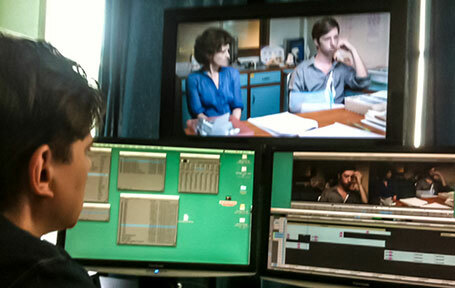 Böhler also edits the films of Angelina Maccarone, including the award-winning drama Verfolgt (2006). She is best-known, however, for her collaborations with Christian Petzold. Her work on Die innere Sicherheit (2000) was awarded the Preis der deutschen Filmkritik and at the Kinofest Lünen. Her editing of Petzold's GDR drama Barbara was nominated for a German Film Award in 2012.